Special from OyanNews : 27 june 2013, thirty six of Azerbaijan’s human rights activists were arrested in Urmia while departing for the Sahand Hillside. Based on the reports of the Oyan News reporter , on Thursday, 27 of june 2013, on the Shahid Kalantari Causeway bridge, ninety two security officers arrested 36 Azerbaijanis’ activists whilst departing to Sahand Hillside . These activists were going there to participate in the annual event of 26 June, international day against torture , and also Commemoration of Professor Zehtabi which was held in the hilsides of Shand Mountain. Between the arrestees there are 8 women, which are all Azerbaijanis’ civil rights activists. After the arresting, they were transferred by security officers to the Shahid Kalantari causeway bridge police station, where they have been beaten harshly by the security officers. During these hitting some of the activists were injured severely and among all Somayye Alidousti, was reported to be in very poor health situation. According to these reports security officers have transferred Pariya Khalilzadeh ( member of Iranian national women football team ) , Sevda Khalil Zade, Masoomeh Parivaj, Zahra Zad qasem, Hosein Zad qasem, Tohid Hasani, Said Lotfi, Said Abdi to Urmia’s ministry of intelligence office. 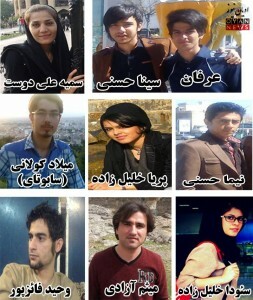 Moreover Somayyeh Alidoust ( who has master of science in atomic and molecular physics from university of Urmia ) and teacher assistant in Urmia university and also a member of Urmia’s women football team , Vahid Faezpour ( Blogger ) and Meysam Azadi ( civil Activist ) , Golam Qolizade ( civil Activist ) , Vahid Nasibi, Morteza Zarrin, Nima hasani, Sina Hasani, Erfan Moghaddam, Sima Sakeni, Milad Koolani( known as Sabootay ) are still kept in Shahid Kalantari Police station and it is highly possible that they are going to be transferred to Tabriz’s ministry of intelligence. We need to add that this afternoon, on 27 of June, 2013 was held the annual celebration of the international day against torture and protection of the victims of torture, and commemoration of Professor Zehtabi as the biggest victim of torture in Azerbaijan, and commemoration of year 2013 which was named after Professor Zehtabi. According to the reports received, security officers have blocked the ways to the Sahand hillsides and are preventing citizens and civil activists from participating in the event in the Hillsides of Sahand.